Dave's Part: Poll: how well will McDonnell do? Poll: how well will McDonnell do? If Newsnight can organise a poll that quizzes a pathetic 30 punters on the Labour leadership contest and tout the outcome as somehow meaningful, Dave's Part can do even better. 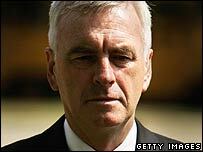 So on the righthand column below the links, you have the chance to voice an opinion on what percentage of the electoral college John McDonnell - pictured left - is going to secure when the votes are finally counted. The comments box is also open. I reckon he will surprise many, provided only that he gets on the ballot paper. My money is on 10-20%. What do you think?